Ancient petroglyph sites found in great abundance throughout present-day Mexico preserve compelling evidence for the Paleolithic origin of pyramid traditions and technologies still practiced by the surviving Mayan descendant culture. 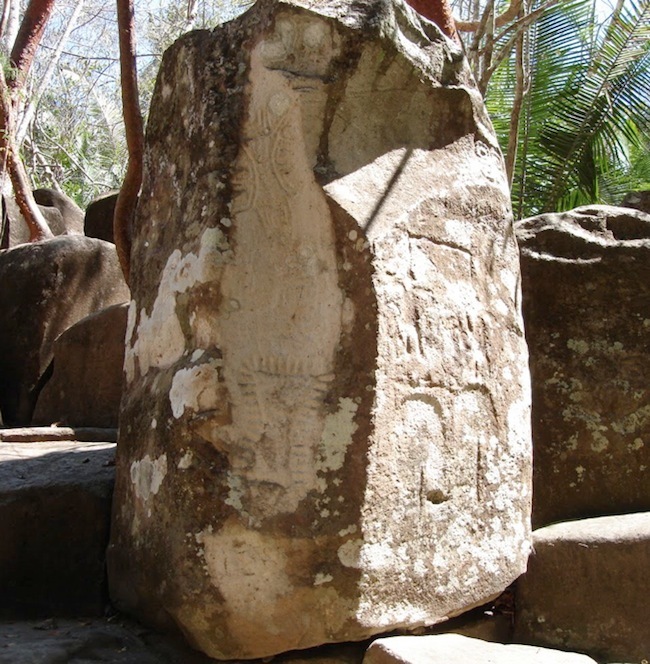 Advanced technological and linguistic remains have been well identified and documented at the sacred petroglyph site of Altavista, located in the coastal zone of Nayarit. 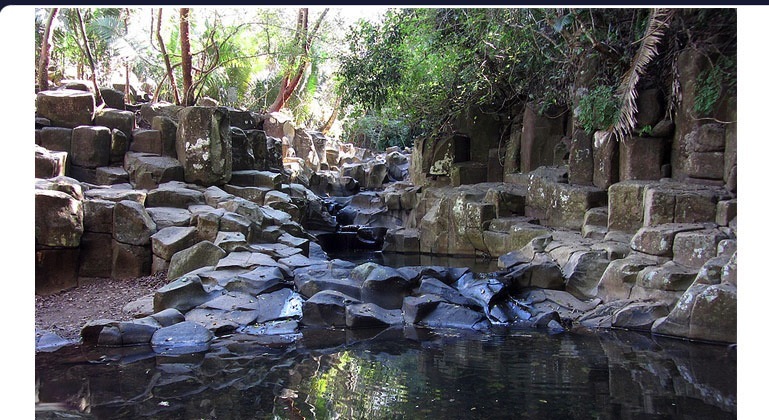 A large complex of majestic basalt stonework emerges from the undergrowth along a seasonal riverbed where one can observe a dense clustering of simple geometric designs engraved in stone. 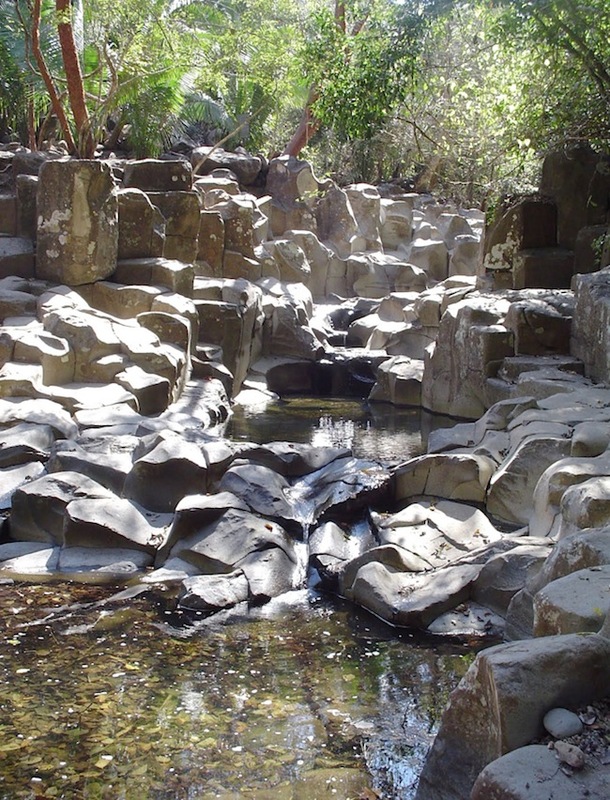 Increasing numbers of intrigued visitors to this special sacred site enjoy fresh coastal breezes rising from the Pacific, while marveling at the ergonomic forms of large interlocking stone blocks that comprise the riverbed. For their convincing similarity to columnar basalts, most visitors never realize the synthetic origin of these megalithic blocks nor the profound psychoacoustic purpose that inspired the site's artificial construction. 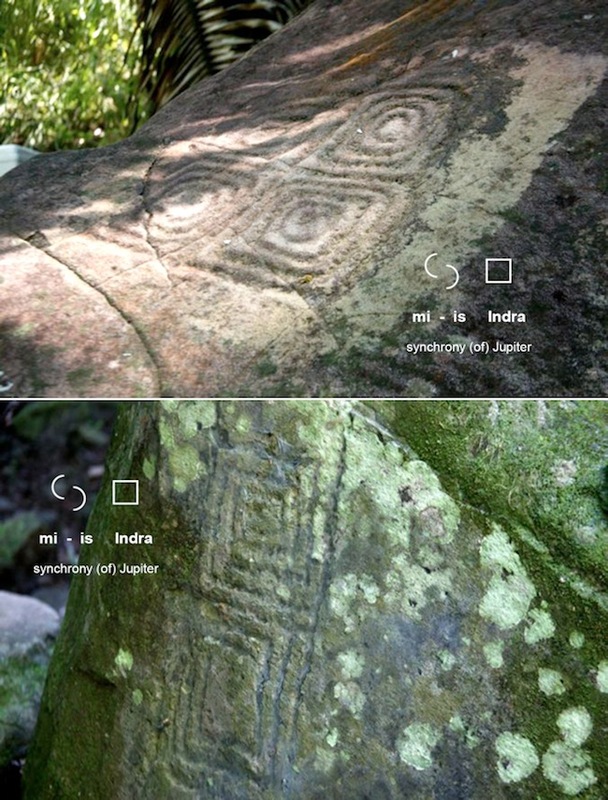 A careful study of the composition of these megaliths, and the complex symbols that adorn them, reveals a profound set of connections with a worldwide Paleo-Sanskrit culture now re-emerging from obscurity. Atlantean builders in all parts of the world constructed a global infrasound network as an array of piezoelectric stone temples and pyramids in perfect alignment with natural focal points of planetary resonance. According to this sacred geodesic wisdom, the pools, petroglyphs and hilltop temples at Altavista, Mexico (21.07°N 105.17°W) were built 7,880 miles from the Great Pyramid, comprising 31.66% of Earth's mean circumference, where infrasound can be efficiently transduced into an EM field. Pure celestial waters with gold and silver nanoparticles were generated by intense electromagnetic fields transduced from localized infrasound resonance by the piezoelectric crystalline stones. Sacred Ayurvedic bioelectrification practices and barefoot lifestyles were adhered to at thousands of sites within this aligned network where the rhythms of pyramids and the planets themselves enhance human consciousness. 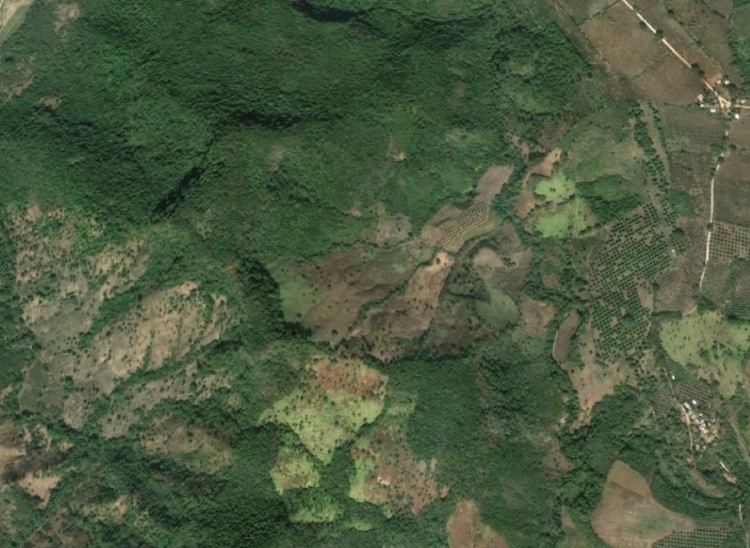 Waterbirthing was ceremonially undertaken in these sacred river pools by generations of Paleo-Sanskrit-speakers at this site under the beneficial influence of infrasonic synchronization by heartbeat resonance between mother and infant. While most crucial during the gestation cycle, this synchronic connection was biorhythmically maintained after their physical separation as a telepathic bond. The very stone itself was considered maternal --'the Motherstone'-- for this profound synchronization effect, and for many thousands of years was signified in textual format by the mesmerizing Paleo-Sanskrit glyph pair: mi-is. The double spiral formation is a hypnotic extension of the basic hieroglyph pair composed of nested semicircles: mi , meaning "waning, diminishing", and is for "waxing, swelling". 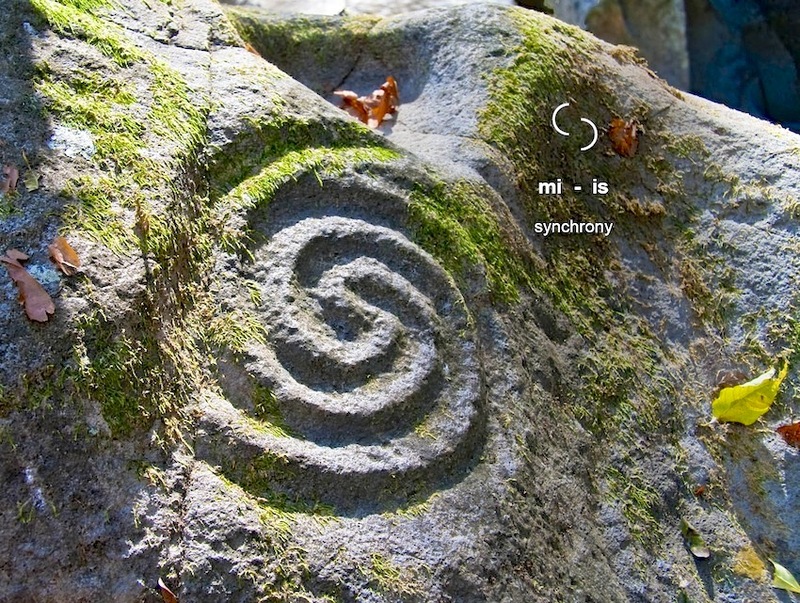 Combined into a legible grouping known as a ligature, this double spiral mi-is petroglyph denotes "synchrony, rhythm" (above). Spirals are the most abundant glyph ligatures recorded on these ancient geopolymer stone ruins. In fact, every petroglyph within the Altavista temple complex is a composition of legible Paleo-Sanskrit language signs already deciphered decades ago by epigrapher K. Schildmann. Scientific recognition for all such Paleolithic cultural remnants has been denied by academic suppression of this most ancient of all known hieroglyphic languages, being the antecedent of Sumerian, Egyptian and Mayan logographic text forms. Another iconic example of petroglyph phrases at the Altavista complex is a large sign that further conveys the resonant purpose of the sacred stone for transducing planetary resonance. The central linear figure is outlined twice to form a triplicate design that gives a sense of reverberation and denotes the raua glyph for "roaring", composed of three lines. 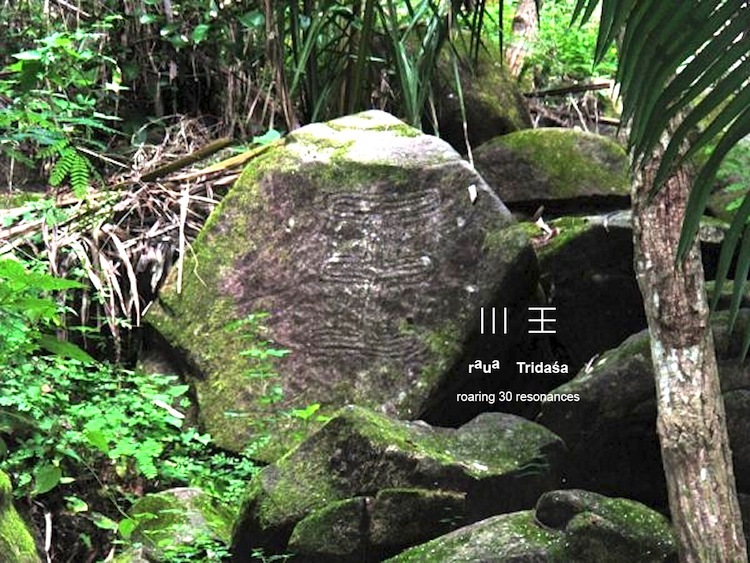 Altogether the ligature reads: raua Tridasa , meaning "roaring 30 resonances" (above). Indeed, scientific analyses confirm the stones themselves still reverberate with the more than 30 inaudible frequencies of infrasound resonance that comprise the planetary symphony. Altavista's stacked megalithic blocks present flat surfaces with smoothly rounded edges and corners that were specifically designed for comfortable seating and socializing along this controlled stretch of the river. Several dozen petroglyphs identified at this extensive temple site relate specific statements regarding the effects of psychoacoustic entrainment. A damaged, oblong rectangular block was marked with a simple repeating glyph ligature that includes the mi-is double spiral with another pair of hieroglyphs, altogether reading: ra-as mi-is ra-as mi-is , meaning "for granting synchrony, for granting synchrony" (above). The petroglyph of a stick figure with arms raised can be found in all parts of the world, yet displays a more complex expression in the Altavista rock art complex. Generally understood as signifying cosmic receptivity, with the figure's arms and legs taking the form of twin tuning forks, the context of the figural petroglyph at Altavista offers several interesting factors informing our interpretation. 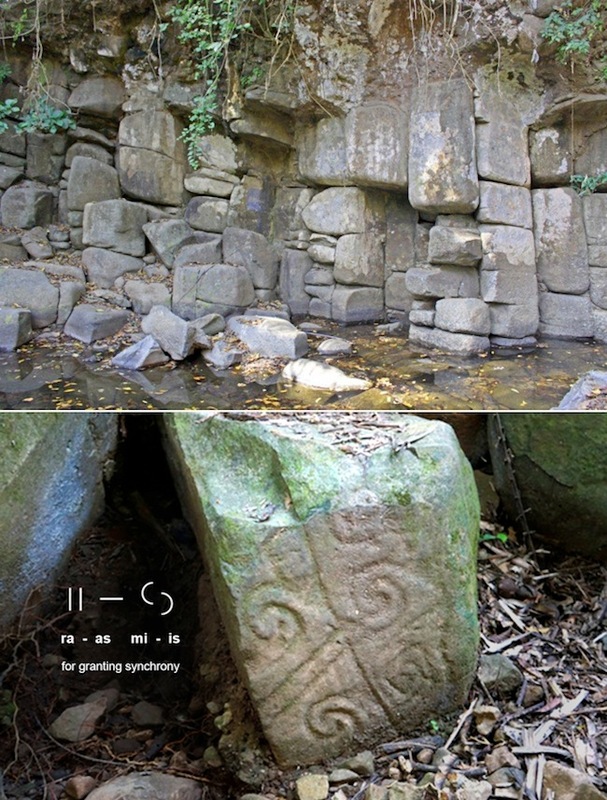 The placement of the figure engraving demonstrates the use of resonant stone slabs for bioelectrical healing platforms (above) of the same exact type discovered in the Ravne tunnels of the Visoko pyramid complex in Bosnia. The Balkan region yielded further Neolithic artifacts from the Starcevo-Cris, Cucuteni-Trypillia, Turdas-Vinca, Villanova, and Lepenski Vir cultures that include many intricate examples of mi-is double spiral signs for induced biorhythmic synchrony through contact with resonant stone. 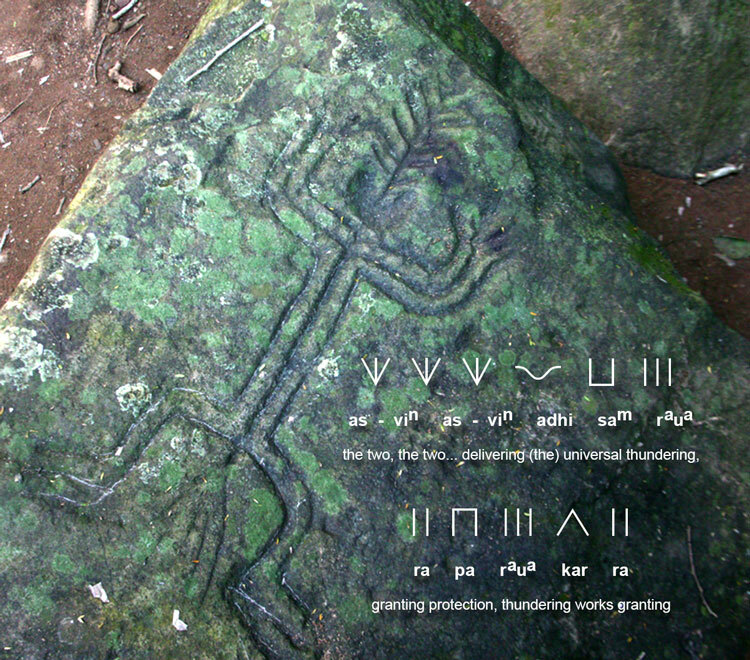 The far older petroglyphic figure displayed on the healing platform at Altavista represents a pictogram composed of many glyphs, providing a Paleo-Sanskrit votive phrase praising protection from the Sun and Jupiter, 'the two': as-vin as-vin as-vin as-vin adhi sam raua ra pa raua kar ra , meaning "the two, the two... delivering (the) universal thundering, granting protection, thundering works granting" (above). The petroglyph figure also indicates a body position and orientation for a person lying on the healing platform to receive treatment from a practitioner of the ancient qi meridian healing technique. The physical structure the meridians and vital points of the human body, known to Ayurveda as srotamsi ('channels') and marma points, were rediscovered by B.H. Kim in 1963 using in vivo fluorescence microscopy as finely bundled nodal networks of translucent ductules that slowly circulate photon-trapping DNA granules. Modern Moi Pai Master John Chang demonstrated the bioelectrical healing artform on video, as well as pyrokinesis, revealing the profound sacred biophysical science behind qi meridian healing that finds its roots in advanced Atlantean techniques applied in pyramid and temple chambers. Brief plasma discharges around Chang's body during electro-acupuncture sessions as a visible sign of the intense accumulation of electromagnetic energy within his body, as applied by Atlantean practitioners using healing platforms. 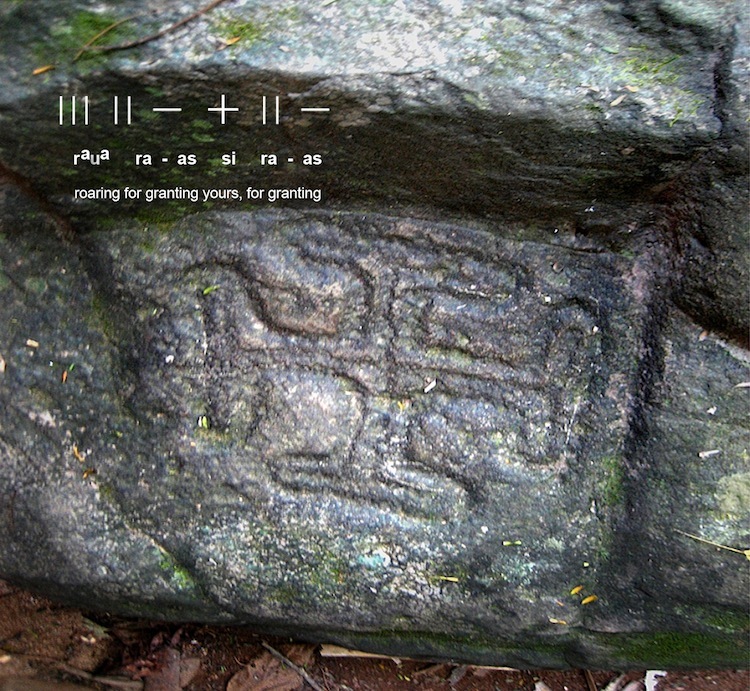 On the side of the geopolymer healing platform at the Altavista complex, near the position of the head as indicated by the petroglyph, is a boldly outlined sacred cross inscription that provides an explanatory ligature phrase: raua ra-as si ra-as , meaning "roaring for granting yours, for granting" (above). The Paleo-Sanskrit sacred symbol of the square spiral is seen in petroglyphs and ceramics on every continent of the world and was used among the later Sumerian, Egyptian, Greek, Etruscan and Roman civilizations who had skillfully replicated Atlantean geopolymer temples for wireless power transmission. In fact, dozens of antediluvian Paleo-Sanskrit hieroglyphs were commonly used among diverse cultures. The square represents Indra, the planet Jupiter, praised as 'the one' for its Giant Red Spot and resounding infrasonic emanations that were transduced by the world's pyramid network for the benefit of humanity. A ligature combining the square Jupiter glyph and the double spiral 'synchrony' glyph forms a square spiral. 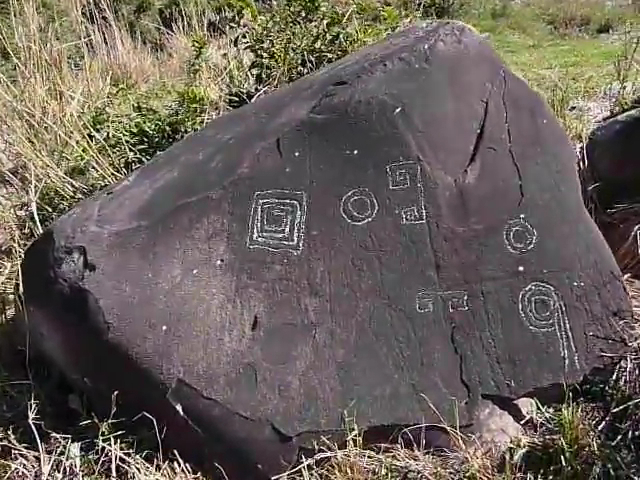 Many examples of square spiral signs engraved in basalt at Altavista are given symmetrically in pairs or mirrored in sets of four, reading: mi-is Indra mi-is Indra , meaning "synchrony (of) Jupiter..." (above). Square spirals are also engraved into several massive, fractured megaliths atop the Altavista hill temple located just above the extension of artificial geopolymer riverbed. Square spirals denoting the synchrony of Jupiter are modified by the basic glyphs of a double circle, reading: nau ra , for "spaceships granting". The triple circle provides the basic ligature phrase: nau raua , meaning "spaceships roaring", referencing the 30 frequencies of thunderous infrasound used by vimana spacecraft for acoustic levitation. Amazingly, contactee Billy Meier made audio recordings of 'roaring' spacecraft resonances in the audible range. Various segments of Altavista's fine synthetic basalt petroglyph panels have been worn thin or heavily damaged during catastrophes incurred long ago, having left large areas where the outer layer has entirely cracked off. This type of surface damage feature corresponds to well known casting defects resulting from the slightly different consistency of the fine outer slipcoat layer and the bulk filling material of the core. 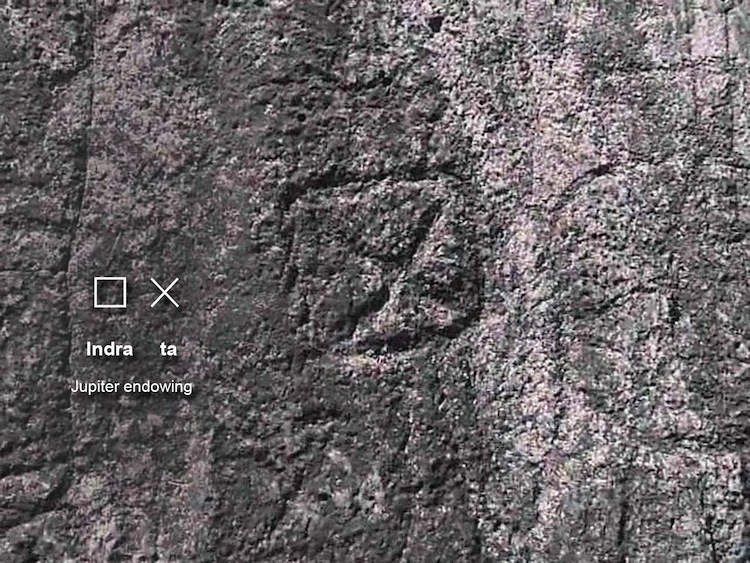 The bold symbol of a square enclosing an 'X' is marked several times on the ancient Altavista hill temple megaliths, providing an explanation as to the primary contributor of booming infrasound resonance focused at this megalithic sacred site, reading: Indra ta , meaning "Jupiter endowing" (above). This basic ligature clearly denotes the geometric configuration of the Great Pyramid as seen from directly above the apex, the central point of the global mandala distribution pattern of resonant standing waves. This we find in that as called Poseida, or the city that was built... so that the waters of these rivers became as the pools about which both sacrifice and sport, and those necessities for the cleansing of body, home and all, were obtained, and these --as we find-- were brought by large ducts or canals into these portions for the preservation, and yet kept constantly in motion so that it purified itself in its course; for, as we find, as is seen, water in motion over stone or those various forces in the natural forces purifies itself in twenty feet of space. The Atlantean canal-city of Poseida was destroyed by tectonic subsidence along with the entire Atlantic continental mass during the cometary bombardment events of 12,890 years ago. 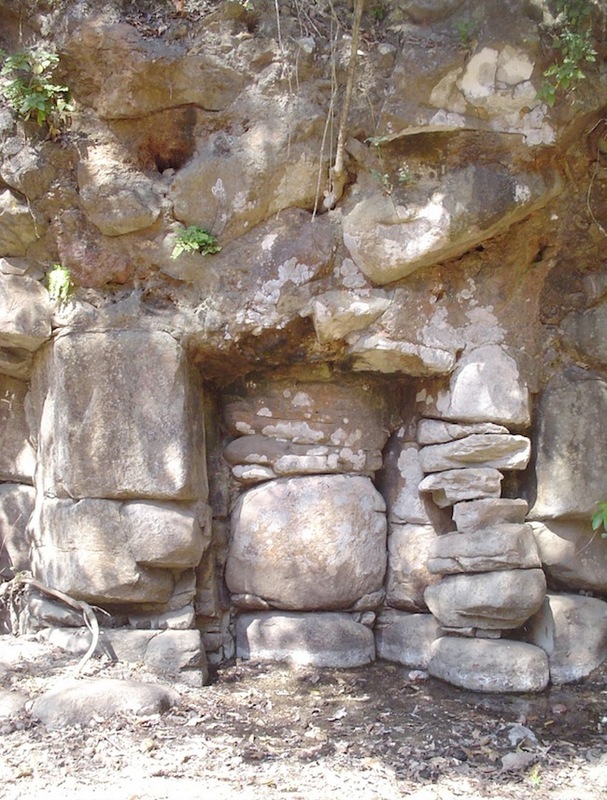 Now relegated to the darkness and cold of the Atlantic Ocean floor in the Madeira abyssal plain, the advanced Atlantean physics of infrasound resonance used for the electrification and purification of sacred waters was applied in an identical manner at the sacred Paleolithic temples at Altavista, Mexico. Translation of the remarkably preserved petroglyph texts of the Altavista temple complex confirms the profound Atlantean technology of transduced planetary resonance for psychoacoustic synchrony and bioelectrical healing. These techniques formed the impetus for a global pyramid network that awaits our renewed use, as the Magnetic Reversal of Earth restores the vital forces of planetary resonance.